You can purchase long flexible strips of small surface mounted LEDs that come on a spool. You can cut the strip to length at the cut marks. You can solder strips together by using the solder pads. The most common type of SMD LED is the ‘5050’ square LED light. A single ‘5050’ LED consists of 3 individual miniature LEDs. These miniature LEDs can be either pure white, all of the same color or red-green-blue (tri-color). As a result, ‘5050’ LEDs are brighter than ‘3528’ LEDs, but ‘3528’ LEDs used in high density strips will be able to provide a similar brightness whilst being more cost effective. in optional IP65 waterproof silicone tubing. in cool white or warm white. with 60° degrees or 120° degrees viewing angle LEDs. running on 5Vdc or 12Vdc power. 30 LEDs per meter or 60 LEDs per meter. with an optional white colored rubberized strip. Analog LED strips come in single–color strips and multi-color strips. Analog multi-color strips are also known as ‘analog RGB LED strips’. Analog single-color LED strips simply have a “+” and “GND” terminal. You can use PWM to change the brightness. You can order these strips in pure white (cool / warm) or a single color. Each individual LED is a single color. The multi-color strips use “tri-LEDs” consisting of 3 miniature Red-Green-Blue (RGB) LEDs inside a single ‘5050’ LED. Single color analog LED strip (top) and multi-color analog LED strip (bottom). Analog multi-color strips have all the LEDs connected in parallel and so they acts like one huge tri-color LED. You can set the entire strip to any color you want, but you can’t set a different color each individual LED. They are very easy to use and fairly inexpensive. 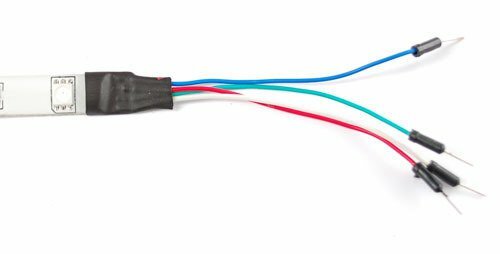 Analog multi-color LED strips have a +12V terminal and separate Red, Green and Blue terminals for the miniature RGB LEDs inside the (tri-color) ‘5050’ LEDs. Using pulse width modulation (PWM) we can change the intensity of the Red, Green or Blue miniature LED from 0V to 12V and generate the desired overall color and brightness. You can use a sharp knife to remove some of the protective tubing and solder wires to the solder tabs. Use heatshrink tubing to make the LED strip IP65 waterproof if required. 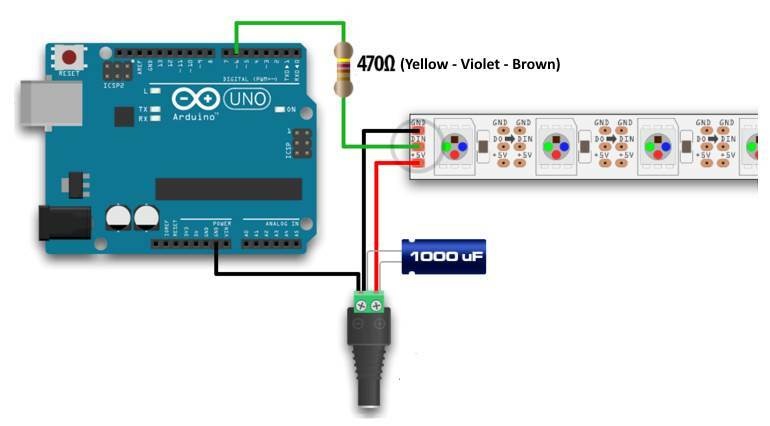 An Arduino digital I/O pin can output a maximum of 40mA. The total amount of current across all pins should not exceed 500mA. A single ‘5050’ LED will consume up to 60 mA. It is good practice not to power a LED strip directly from a digital I/O pin. A 1 meter LED strip with 60 ‘5050’ LEDs per meter = 60 * 60 mA = 3600 mA = 3.6 A max. 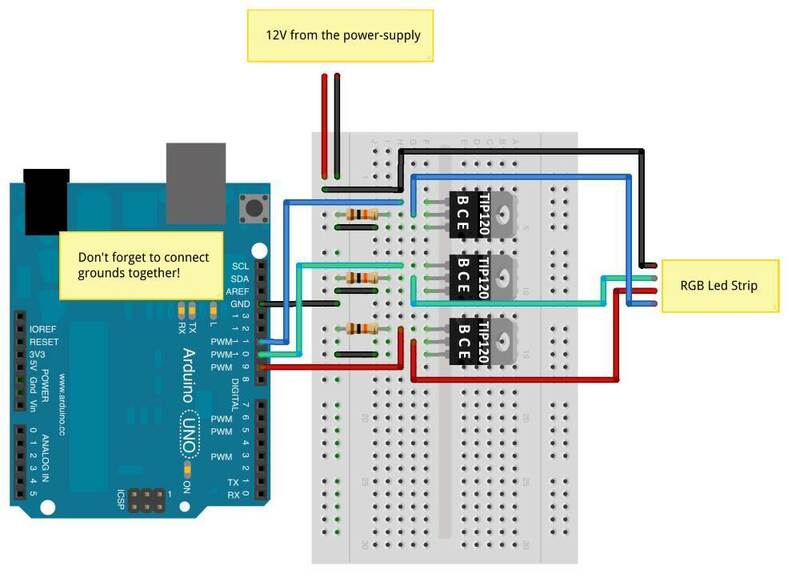 The easiest way to power a LED strip is by using an external power supply. We can use transistors to switch the LED strip on or off. 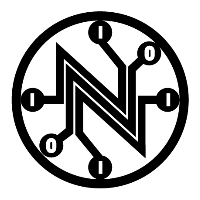 A transistor uses a small current flowing from the Base to the Emitter to create a conductive path between the Collector and Emitter. It is a bit like how the first small patch of loose snow moving down a mountain slope causes an avalanche. A TIP120 transistor (darlington pair) can handle 60V 5A across the Collector-Emitter junction and only needs 2mA applied to the Base-Emitter junction to create a short between Collector and Emitter, just like a switch. Analog RGB strips sold on the internet often come with a 28 or 44 function control unit. 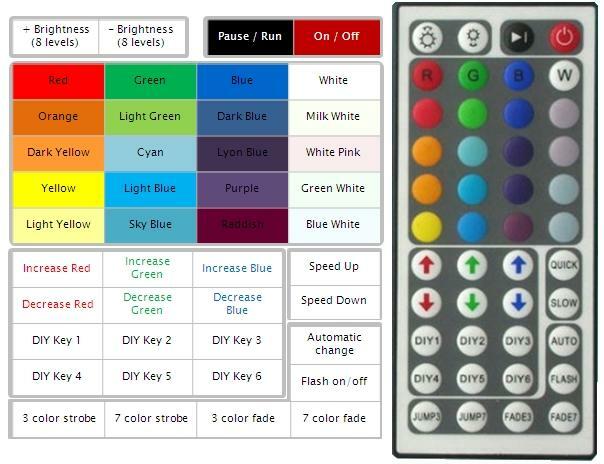 This control unit uses pulse width modulation to change the brightness of each of he Red, Green and Blue channels of the analog LED strip similar to our code. Digital RGB LED strips are also called pixel (addressable) RGB LED strips or Neopixel LED strips. 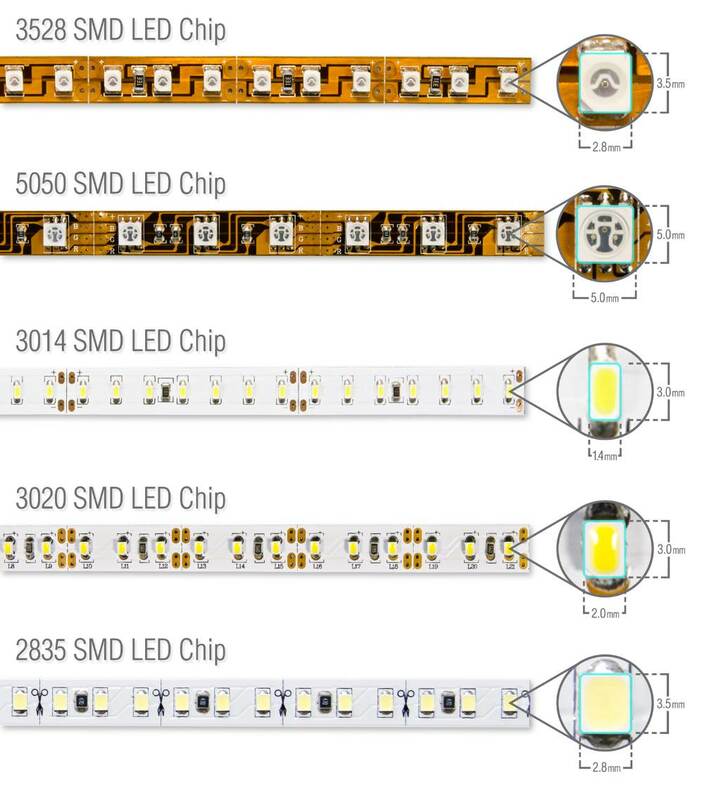 Each LED in the strip is connected to a small chip. This chip allow you to control the brightness and color of each individual(!) LED. The chips used are either WS2801, WS2811 or WS2812. (!) 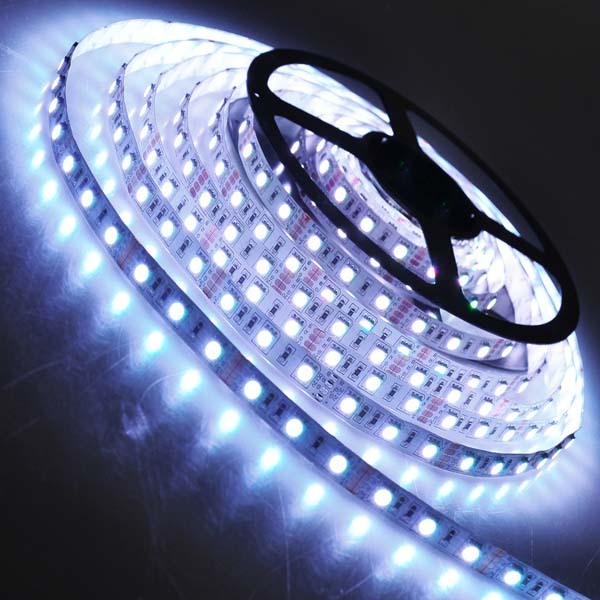 Unlike the analog RGB LED strips most Digital RGB LED strips operate on 5 Volts! Before we start, we should probably identify the differences between the WS2801, WS2811 and WS2812 chips. 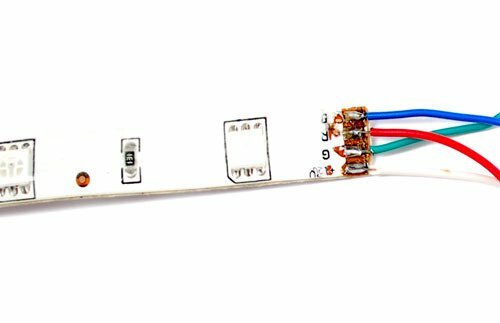 Most projects and descriptions out there discus these sometimes mixed, and for one who dives into LED strips for the first time, these models numbers might be confusing. The WS2801 and WS2811 are LED driver chips. These IC’s can control up to 3 LEDs, typically Red, Green and Blue. Positioned close together, so you as a viewer will see the mixed color result. The WS2801 used to be quite popular but is no longer. The WS2812 however is a WS2811 placed inside a 5050 LED package. The 5050 LED is a very common 3 LED (Red, Green, Blue) package, in one 5mm x 5mm case. On the left a 5050 RGB LED, on the right a WS2812 which combines a 5050 RGB LED with a WS2811 chip. Note how the layout of the “silver” tracks are almost identical in both images, yet the black (IC) block and the tiny wires are different (right). Where the WS2801 strips needed 4 wires, the WS2811/WS2812 strips only needs 3 wires. 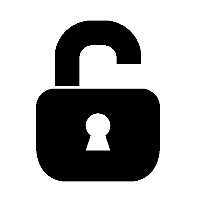 The WS2801 uses a separate clock line, which can be seen as an advantage, whereas the WS2811/WS2812 does not. The WS2811/WS2812 depends on sending data matching a very tight timing. The advantage of the WS2812 though, is that production of these combo’s in strips is easier and therefor cheaper, and each RGB LED takes much less space on strips. We will be using the WS2812 digital LED strips. Digital RGB LED strip (using WS2812 chips and 5050 tri-color LEDs). The resistor is used to protect against voltage spikes and large currents. As the resistor value is very low and these resistors are only 0.25W, they basically act like a fuse and will protect your precious digital RGB LED strip data line (WS2812 chips) from power surges. 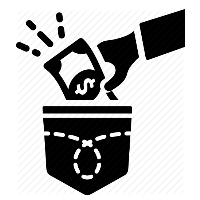 A 1000uF electrolytic capacitor prevents the initial onrush of current from damaging the pixels. The capacitor is not needed for a few (say 1-3) pixels, but definitely recommended for anything more than that, otherwise you risk to damage the pixels! It’s important to pay attention to the arrow on the digital RGB LED strip; if you use your strip in the wrong “direction”, it will not work. Simply connecting +5V and GND will at best flash up your strip for a fraction of a second. 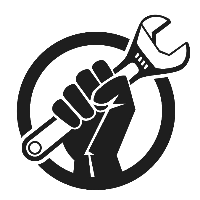 The LEDs need to be “told” to be ON, so without data signal your LEDs will remain OFF.